Snaking through the image is the Chindwin River, which breached its banks during a period of severe flooding in 2015. Monsoon rains beginning that July caused multiple rivers in the region to overflow, causing widespread damage and affecting up to a million people. This image was created using two passes by Sentinel-1's radar: one before the flooding on 20 March 2015 and the other during the event on 4 September 2015. 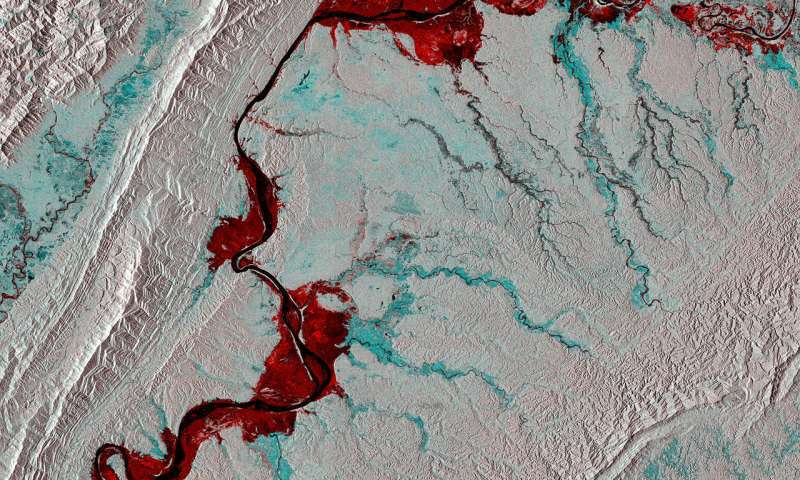 Combining them shows changes between the images, such as the inundation of some 111 000 hectares of land on either sides of the river bank appearing in red. This information was then released in the form of a map under the International Charter Space and Major Disasters to assist relief efforts. Currently led by ESA, the Charter is an international collaboration between 16 owners or operators of Earth observation missions. It provides rapid access to satellite data to help disaster management authorities in the event of a natural or man-made disaster. Sentinel-1's radar ability to 'see' through clouds, rain and in darkness makes it particularly useful for monitoring floods.